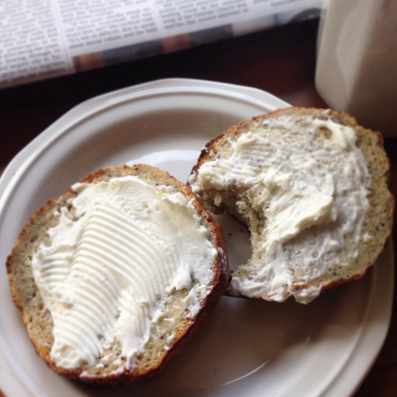 Rise Bakery | Gluten Free D.C.
What I got: Everything bagel with plain cream cheese. The bagel was a little more dense than I would’ve liked, but if you’re missing this specific vehicle for cream cheese and lox, it totally works. Gluten-free friendliness: Rise Bakery is 100% gluten-free. As expected with places that cater to one dietary need, they’re hyper-aware of ingredients and labeling for all products. Everything is flagged if they’re also free of dairy, egg, soy or nuts. There’s also a freezer with fresh bread and bagels if you want to take some home with you for the week. Overall vibe: Rise has been around for a little more than a year, but the space still feels sparse. A few more decorating touches would make the place feel more inviting. But the friendly staff makes up for the lack of design warmth. I wouldn’t say these are the best gluten-free baked goods I’ve ever tasted, but I support their efforts and the fact that this place exists at all. They’re constantly improving their products and are always open to feedback. This entry was posted in Adams Morgan, Uncategorized and tagged Adams Morgan, Bakery, Breakfast, GlutenFreeDC, WashingtonDC. Bookmark the permalink. Pingback: The Little Beet | Gluten Free D.C.